Jagjit singh is widely acclaimed as "The Voice Of Emotions", and continues to enthrall listeners with his soothing musical compositions and beautiful renderings. A romantic Ghazal, a lilting Geet a film song or a blissful bhajan, Jagjit Singh adds his magic to elevate a melody to sublime levels. His is the language which touches hearts and finds acceptance across the Indi Diaspora. 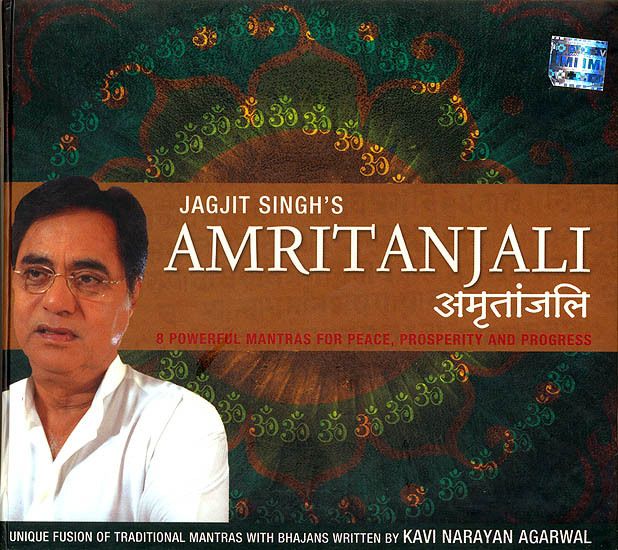 In today's stressful times Jagjit Sin devotional music acts as a de-stresser for wo: weary souls. Jagjit Singh lives in Mumbai and spends time globe-trotting with his music concerts all the while creating that one more musical masterpiece for millions of his admirers to Cherish. Bhajan Ratna Kavi Narayan Agrawal, 'Das Narayan' has joined the lineage of famous devotional poets of India by penning his bhakti-padas for leading vocalists of the country like Pt. Bhimsen Joshi, Pt. Jasraj, Kishori Amonkar etc. among a long list of other luminaries including Lata Mangeshkar, Anup Jalota and Jagjit Singh. His stirring devotional verse is a result of his undying faith in the almighty and his deep concern for humanity. A man of varied hues Shri Agrawal, has been a recipient of several prestigious awards from various social and cultural institutions. His discourses on mental peace and harmony are very popular. Amritanjali is a work close to his heart and mirrors his gentle yet thoughtful personality. Amtitanji, literally means ‘an offering of nectar’. It is a unique fusion of essential mantra and evocative bhajans to enhance the spiritual experience. The album includes 8 of the most powerful mantras of Hinduism and is a sublime route to a wholesome life.